There’s a saying among those in the medical profession, when you hear hoofbeats think horses, not zebras. It means the most obvious answer is usually right, it keeps us from heading down the wrong path. It helps us save lives…..But I’m a zebra! There are many different types of EDS including Classical, Vascular, Hypermobility, as well as more rare types such as Kyphoscoliosis, Dermatosparaxis and Arthrochlasia but I won’t go into all them. There is no cure for EDS and there is no treatment for it as such you just treat the symptoms as they appear. I have Hypermobility EDS or EDS type III and was diagnosed by a clinical diagnosis meaning based on physical examination and history. At present all my joints are hypermobile except my right hip and left knee…yay for them!!! but I have been lucky so far in that my only dislocation has been my left hip, which my poor frightened mum managed to put back into place with a lot of screaming…from both of us! I also have velvety smooth skin, not a sign I’m complaining of!! and it is hyperextensible. My skin is also prone to severe and widespread bruising. Chronic pain is a well established and cardinal manifestation of HEDS, this is not one of the nicer symptoms, I have pain all over my body for seemingly no reason most of the time, my back has caused me the most trouble over the years, I was actually hospitalised when I was 13 for severe back pain so bad I had to learn to walk again, having 3 hours of physio per day in hospital, at the time my parents were worried sick as they didn’t know what was wrong with me, now it all makes sense 13 years later. Chronic pain is not easy to live with but I know I am nowhere near as bad as some people so I get on with it and don’t let it interfere with my life too much, don’t get me wrong there is days were I just can’t fight through it and have to give in but 95% of the time that doesn’t happen. Of the 12 symptoms listed above I have 9 of them at the moment so I won’t go through them all…. I’m going to see a gastroenterlogist now in September to deal with my gastro issues which again I have had for years but never could figure out what the problem was so hopefully this new Doc will have some ideas to help reduce the bloating, abdominal pain, constipation and diarrhoea! Keep your fingers crossed for me! As for the headaches and migraines they are a daily struggle and I have tried multiple medications to help them none have really done the job for me but I’ve recently started on Lyrica so hopefully this will be the one for me! Being diagnosed with EDS was kind of like the final puzzle piece being put into place it explains everything over the years. I have two Doctors to thank for my diagnosis my cardiologist who suspected it and then the rheumatologist who diagnosed it. Now that I know I have EDS I can deal with it and focus on moving forward with my life, right now there is nothing that I can do about it, its in my genes I can’t change it, I won’t get better I have this for life but that doesn’t mean it is my life. 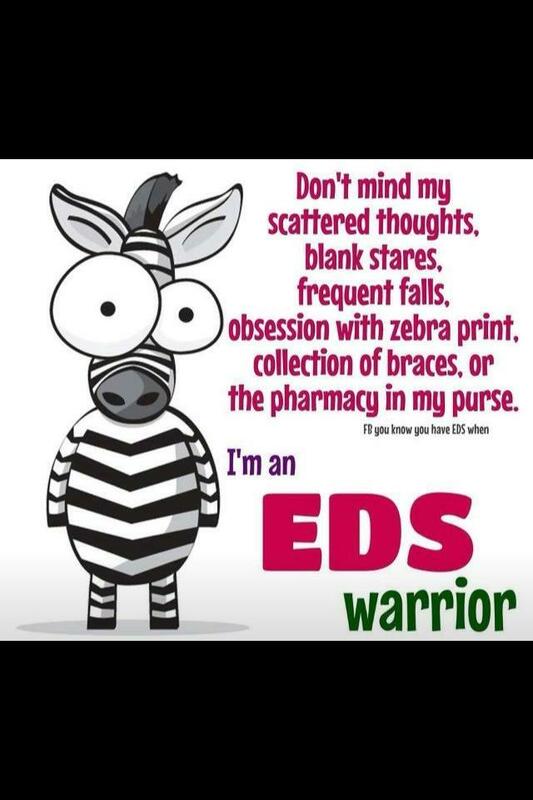 I have EDS but I am not defined by it!! Very well written kim.very bravely you to share your experience. It may help somebody else. Hopefully life will get easier now you have a diagnosis. All the best. Hope all else is well. Your looking very well take care Kim.